So, I was wrong about Haytham. At least for now.. No sign of Haytham in the trailer or in the early details that have been released. But, I was right about the Assassin turning rogue. We see a former-Assassin named Shay, who is now out for revenge and is on a mission to slay Assassins. Very interested in the story behind the motive for turning on the Assassins. Also, we see lots of icebergs and frozen seas in the later part of the trailer. So, if the hunting missions make a come-back in this game, maybe we get to hunt Polar Bears, Seals and Walruses? Let's wait for more details.. Well, in the meantime.. take a look at the Collector's Edition revealed for the game. 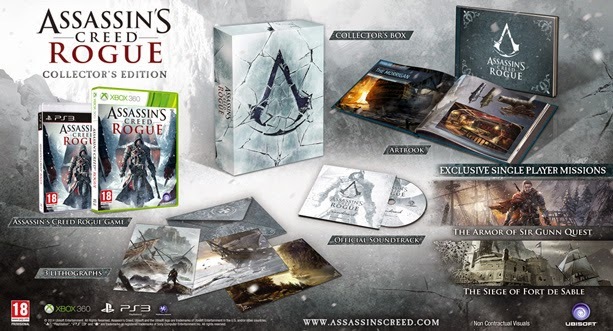 A Collector's box, sporting the Assassin's Creed emblem with a shattered look, Mini-Art book, Soundtrack, 3 Lithographs, the Game and 2 exclusive Single Player missions. Only 1 Collector's Edition revealed so far and no Statue. What? No Statue?!!!! !